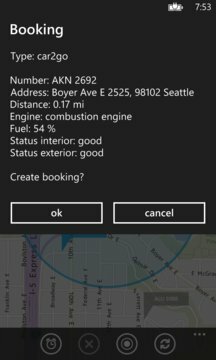 Car Radar is the most popular car sharing app for Windows Phone, with car2go, DriveNow, Multicity* and the bikes of Call a Bike. Vehicles can be found and booked quickly & easily. With the unique radar function you are the first to get the next available vehicle. Car Radar will notify you via speech output and book the vehicle automatically. • CarRadar operates on demand as a background application and updates data every 60 seconds. Data volume: ca. 2 MB for 30 min search. 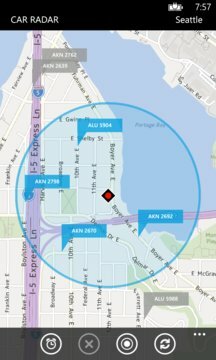 • To avoid false alarms the location in active search is updated only if the accuracy is high enough. • Background applications are closed when the power-saving mode is active or another app claims the location function. In this case, a warning message appears. • The permission for use of the identity and the media is required to display advertising. However, no media content is passed on from the device. • *Multicity does not support reservations by third party apps. You will be redirected to the booking website. New York Brooklyn, Austin, Seattle, San Diego, San Francisco, Minneapolis, Denver, Portland, Columbus, Miami, Washington DC, Toronto, Calgary, Montreal, Vancouver, Hamburg, Berlin, Munich, Stuttgart, Düsseldorf, Frankfurt, Vienna, Amsterdam, Milan, London, Rome, Florence, Bologna, Madrid, Copenhagen etc.